Most love a good cappuccino, but where did it come from? The cappuccino only began to become popular in America in the 1980s. This has led some people to believe that the cappuccino is a "new" drink. However, this drink dates back hundreds of years and has been enjoyed by generations in Italy and continental Europe. In Europe, coffee drinking was originally based on the traditional Ottoman style of preparation. Water and coffee beans were brought to a boil, and sometimes sugar was added. This is similar to modern-day Turkish coffee preparation. By the late 1700s, the British and French had started filtering coffee beans from their coffee. Gradually, filtered and brewed coffee became more popular than boiled coffee. It was around this time that the term 'cappuccino' originated (though it was not used to describe the drink as we know it). Cappuccinos first popped up as the 'Kapuziner' in Viennese coffee houses in the 1700s. A description of the 'Kapuziner' from 1805 described it as "coffee with cream and sugar," and a description of the drink from 1850 adds "spices" to the recipe. Either way, these drinks had a brown color similar to the robes worn by the Capuchin ('Kapuzin') friars in Vienna, and this is where their name came from. (A similar drink of the time was known as the 'Franziskaner'; it was made with more milk and named after the lighter-brown robes of the Franciscan monks.) The word 'Capuchin' literally means cowl or hood in Italian, and it was a name given to the Capuchin monks for their hooded robes. Although the name 'Kapuziner' was used in Vienna, the actual cappuccino was invented in Italy, and the name was adapted to become 'Cappuccino.' It was first made in the early 1900a, shortly after the popularization of the espresso machine in 1901. The first record of the cappuccino we have found was in the 1930s. 'Cappuccini' (as they are known in Italy) gradually became popular in cafes and restaurants across the country. At this time, espresso machines were complicated and bulky, so they were limited to specialized cafes and were operated solely by baristi. Italian coffee culture involved sitting around in these specialized cafes for hours, enjoying espresso, cappuccinos, caffe lattes, and other drinks over conversation and reading. 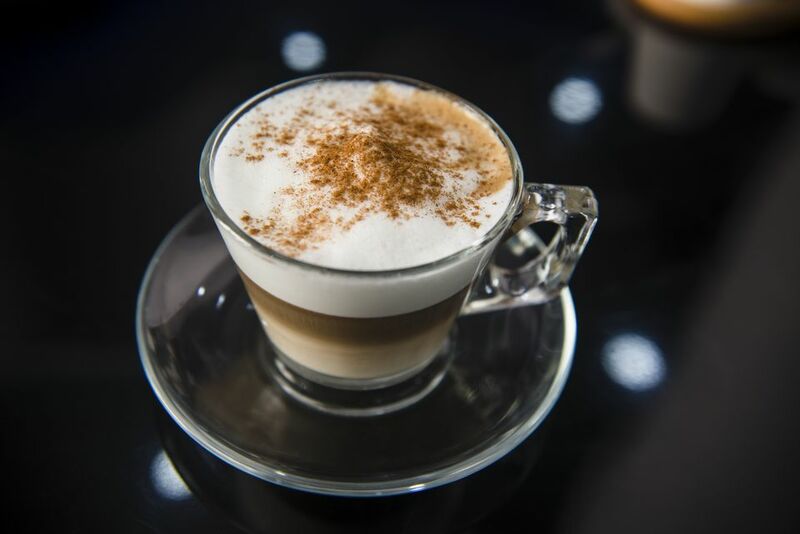 Photos from the era indicate that cappuccinos were served in the "Viennese" style, which is to say that they were topped with whipped cream and cinnamon or chocolate shavings. After World War II, the cappuccino making went through some improvements and simplifications in Italy. This was largely thanks to better and more widely available espresso machines, which introduced the so-called "Age of Crema." These improvements and the post-WWII affluence across parts of Europe set the stage for cappuccino's eventual worldwide popularity. This is when the modern cappuccino was born, so to speak, as it is when all the elements we now consider to make a great cappuccino (good espresso, a balance of steamed and frothed milk, the presence of crema and a small, preheated porcelain cup) were all in play. Cappuccinos first became popular across continental Europe and England. (In England, the first popularized form of espresso was, in fact, the cappuccino. It spread across the island easily because the Brits were already accustomed to drinking coffee with milk by that time, but the distinct texture and the cafe culture of the cappuccino set it apart from regular coffee with milk.) Later, the drink moved to Australia, South America, and elsewhere in Europe. They then spread to America beginning in the 1980s, primarily due to its marketing in coffee shops (which had previously been more like diners with black coffee on offer). In the 1990s, the introduction of cafe culture (and higher priced drinks which correlated to the longer use of a seat in the coffee shop) made cappuccinos, lattes and similar drinks a big hit in the US. More recently, they finally appeared elsewhere in the world, largely due to Starbucks. For the most part, contemporary cappuccinos are made with espresso, steamed milk, and foamed milk. However, in some parts of the world, cappuccinos are still made more like Viennese Kapuziners, complete with whipped cream and other additives. This includes Vienna, much of Austria and Europe (such as Budapest, Prague, Bratislava, and other parts of the former Austrian empire). This even includes even Trieste, Italy, a city which now borders on Slovenia and which has been held by various countries over the years. Since the 1950s, both cappuccinos and Kapuziners have been served in espresso bars since the 1950s. Over the last three decades, automatic beverage machines in America and some other countries have sold a drink that is called a 'cappuccino.' These drinks are often made with brewed coffee or instant coffee powder and with powdered milk or milk substitute. They are not foamed and frothed but are whipped inside the machine to create bubbles. This unfortunate drink bears little relation to a true cappuccino. In recent years, some European cappuccino customs have changed. Most notably, some Europeans (particularly those in the U.K., Ireland, the Netherlands, Germany, Belgium, France, and Spain) have begun to drink cappuccino throughout the entire day rather than only in the morning. Now, cappuccinos are popular at cafes in the afternoon and at restaurants after dinner. Coffee Bar - What are Coffee Bars?